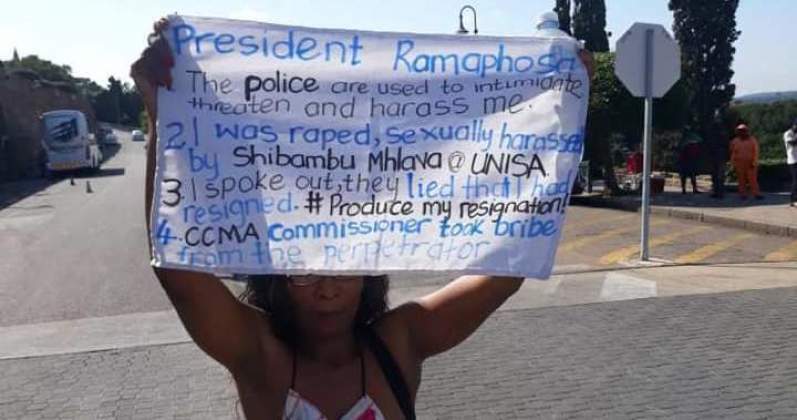 A woman who staged an undressed protest outside at the Union Buildings in Pretoria on Wednesday morning has been arrested. Gugu Ncube demonstrated outside the seat of government after claiming she had suffered abuse at the hands of the University of South Africa (Unisa) and the South African Police Service (SAPS). Ncube claims her boss at a former Unisa-sponsored centre had asked her for sexual favours in exchange for her keeping her job. She said claims that the she had resigned were false. She says this was when her manager made the unwanted and unsolicited advances. "I want the Unisa management to show the country, Thuma Foundation, Commission For Gender Equality and other interested parties, my resignation letter they claim I tendered. This is my demand," she told News24 this morning before she started protesting. When asked why she had decided on such a protest, Ncube said she had "nothing more to protect". "N*dity is a sign of my dignity that l have been stripped of. I have nothing more to protect. My dignity is gone." She wants President Cyril Ramaphosa to takes note of this alleged abuse. Ncube said she was manhandled after reporting her boss to the police. "I have seen first-hand [a] commissioner sitting on my supposed tribunal taking bribe money to discredit me. "I have seen corrupt police come to arrest me unprocedurally because my abuser has money to pay them. I will be heard," she said. Unisa, however, says that Ncube's claims are "misconstrued". "It is regrettable that Ms Ncube is persisting with her action of dragging the name of Unisa into her dispute with UCECE (Unisa Centre for Early Childhood Education); and in the process bringing our name into disrepute. Whilst we respect her right to fight for what she believes is unfair treatment towards her, we appeal to her to desist from her actions; and that the name of the university should not be dragged into this matter as it is solely between herself and UCECE", said Unisa Principal and Vice Chancellor Mandla Makhanya in a statement. The institution said that Ncube was employed by the UCECE, an external company previously sponsored by Unisa. Sunnyside police spokesperson Captain Daniel Mavimbela confirmed that Ncube had been arrested. "Our members were called after it was reported that a woman was standing undressed at the Union Buildings. "She is expected to be charged with public indecency and should appear in court soon. It is an offence to stand undressed in a public place," he said.